I have already reviewed Allnic’s wonderful T1500 300B integrated amp, and now I am reviewing the complete Allnic front-end, starting with the H-3000 LCR Reference phono stage, then adding the L-3000 line stage, and finally I will add the newest version of the Allnic Verito MC. The reason for writing three different reviews instead of just one is that if I put all three pieces in at once, I will really have no idea how they each affect the sound. If I add them one at a time, I will be able to share with you how each piece sounds individually and how they sound as a whole. Kang Su Park of South Korea has been a devout lover of valve electronics for a few decades. First he was with Silvaweld, then he started Allnic Audio. Allnic was the company that would give him the opportunity to build equipment that would compete or exceed products from established companies like Audio Note UK, Kondo, Shindo, Wavac, and the like. In a wonderful phone interview, Mr. Park shared with me certain principles that he feels are important to designing valve electronics. He uses valve voltage regulation for superior noise floors of low-level circuits. He feels this is particularly important in phono stages. He also believes in using over specified power transformers and large valve rectifying circuits in front-end pieces, and rectifier bridges for power and integrated amplifiers. Like many of the Japanese Artisans, Mr. Park believes in matching the very best valves for the intended application as well as transformer coupling whenever possible. He also has in-house capabilities for most of his work, including winding of all his transformers, and exclusively using Permalloy core transfers in the signal path. He also uses his patent-pending Absorb-GEL tube damper sockets to reduce microphonics. One other thing that Mr. Park has set out to do is to advance the art of valve transformers. His attempt at the ultimate phono preamp is the H-3000, and it is my privilege to review it. It is a two-chassis unit, the power supply is housed in a separate chassis that contains a 5AR4 rectifier tube, a power transformer, and a choke transformer. 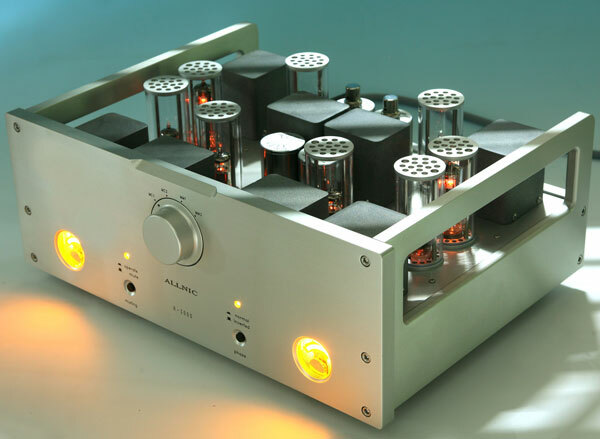 The main chassis houses two amplification tubes per channel, the NOS Mullard E810F. It also houses two additional tubes per channel for power regulation, so it has a total of eight tubes housed in the main chassis. The tube sockets are the gel-impregnated Allnic types that isolate the signal tubes from microphonics. The H-3000 is a transformer-coupled phono preamp and the main chassis also houses all the transformers. This results in the H-3000 being very heavy for a phono preamp, weighing in at about 36 pounds. The H-3000 is a very classy looking unit. The one I review was silver and the front panel was an impressive thick brushed aluminum. It has two small, attractive, and useful current meters on the front panel along with a large central knob for selecting the INPUTS. There are two moving magnet Inputs and two moving coil Inputs to choose from. The front panel also has a MUTE switch and a PHASE switch. The overall appearance of the H-3000 is just plain classy. The rear panel has one pair of balanced outputs and one pair of unbalanced outputs. There are also the RCA jacks for the phono inputs. The H-3000 has adjustable gains of 22dB, 24dB, 26dB and 30dB, you can also change the resistive load to accommodate cartridge matching. One of the most important ways Mr. Park is trying to improve phono preamps is by the way he implements the RIAA curve. Most valve amplification companies, even the ones making the most expensive SETs are still using phono designs that use various arrangements of capacitors and resistors. Instead, Mr. Park uses a LCR filter which uses two pieces of a linear reactor (a type of choke filter) for the main part of the RIAA filter. In vacuum tube circuits, typical filter usually operate one hundred plus kilo ohms of impedance. An LCR RIAA filter has a constant impedance of 600 ohms. It also has a series resistance that is less than 13 ohms compared to other that are two or three times higher. With lower impedance, you should theoretically get more dynamics, faster transients, and better bass response. The H-3000‘s RIAA phono equalizer is also completely transformer coupled. The LCR RIAA filter also has no negative feedback and only two stages of amplification. I’m not sure I even understand what all that means, but it’s what the H-3000’s manual says. What I do know is what my ears tell me, and they tell me there is something fundamentally different about this phono preamp. Hi Jack. Which Setting would you recommend with a Koetsu Black cartridge. Love your review… I have the H 7000 …Still experimenting with the recitifier tube..any recommendations?